Berlin ist a city beyond comparison – a lively and cheerful capital that offers plenty of interesting activities. If you want to get to know the city with your group, a tour by one of our busses will be the most convenient way to do so. Whatever the occasion and no matter if you have planned a business event or a club excursion to Berlin – we will take care of your mobility within the city. Charter a bus and enjoy the freedom of getting to any destination even in large groups and with all your luggage easily. Do you plan to offer a shuttle service for your guests, customers or business partners while organising your fair, congress or event? Connect all the different places of action by bus transfers! We want to offer an extraordinary service for you and your guests in way that makes exploring Berlin a fantastic experience. 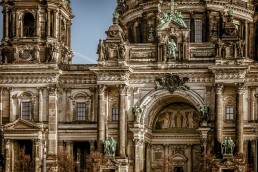 Hire a bus in Berlin and explore the big city in a flexible and relaxed way! 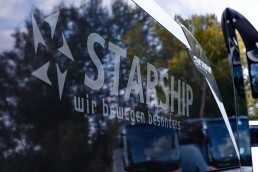 Starship stands for high-level service including the latest vehicle technology, luxurious features of our VIP busses and qualified chauffeurs. We are happy to fulfill all of your extra wishes such as arranging a porter service for your baggage, hiring a tour guide or organising on-board catering for you and your guests. Lean back and let yourself be chauffeured. Experience Berlin in a unique way. Pick-up at the place of your choice, as many stops as you like and maximum flexibility when planning your journey with Starship. Our expert service will inspire you! Starship is not only a provider of coach and bus transport services but also your full service mobility partner. We are specialised in organising transport concepts for your events and work together with many local partners and institutions in order to guarantee you an unforgettable stay in Berlin – including wonderful trips to the urban hinterland. Rent a bus in Berlin and let us show you the city from its most beautiful sides! This should not be to mention: All of our busses are modern and equipped with the newest security technology, serviced and tested by experts. Hiring a coach is the safest way to travel by group. We offer coaches in different sizes: with our fleet, we are able to transport groups from 10 to 1,000 people. All of our busses are either Mercedes or Setra.